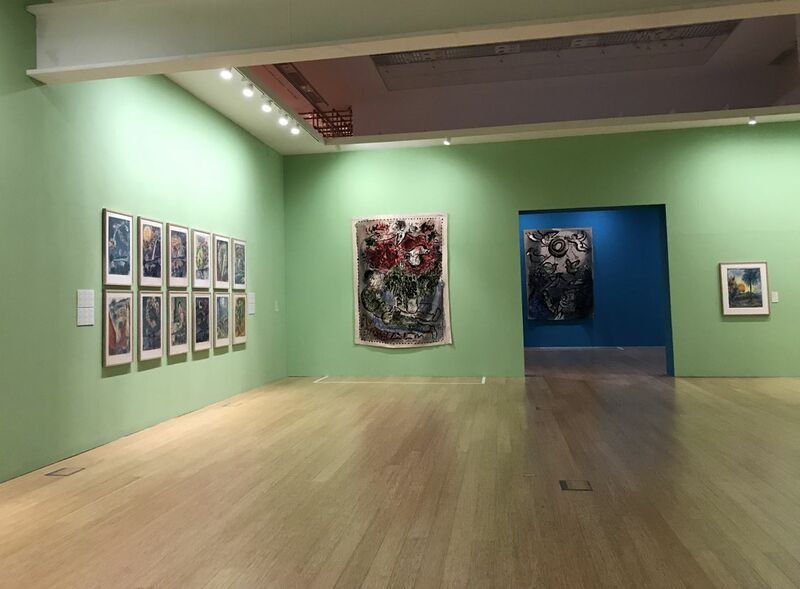 The Macao Museum of Art might not be very big, but it holds marvelous shows -- that are free! 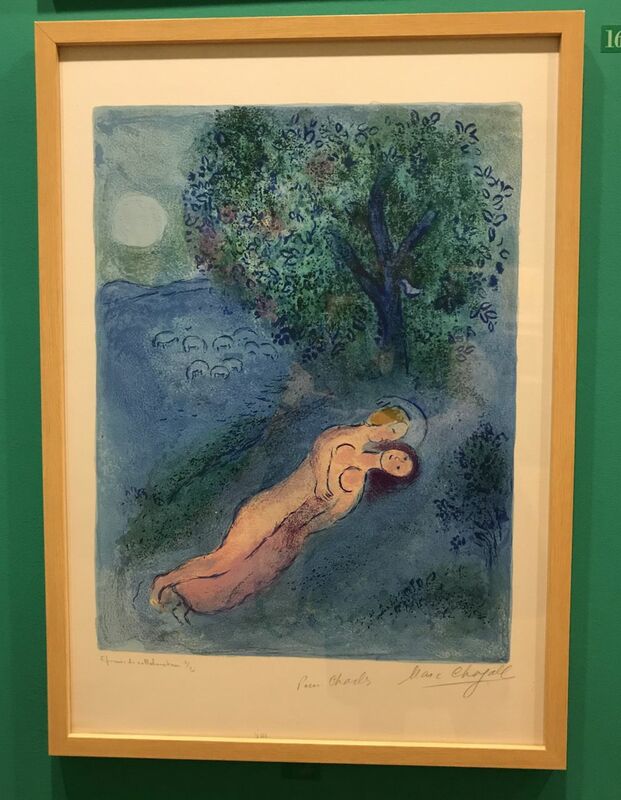 Last year it was on Chinese artist Zhang Daqian's visits to the Dunhuang caves in Gansu province, and this time to coincide with Le French May, a show on Marc Chagall on his years in Southern France. 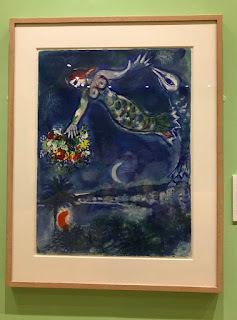 Three years ago we went to Nice and visited the Musee National Marc Chagall. The pieces on display were massive, requiring viewers to stand or sit back to soak in everything that was going on in each canvas. Here it was the opposite -- the vast majority were small pieces that required intimate viewing to fully appreciate the colours, emotions and imaginative compositions the artist made. 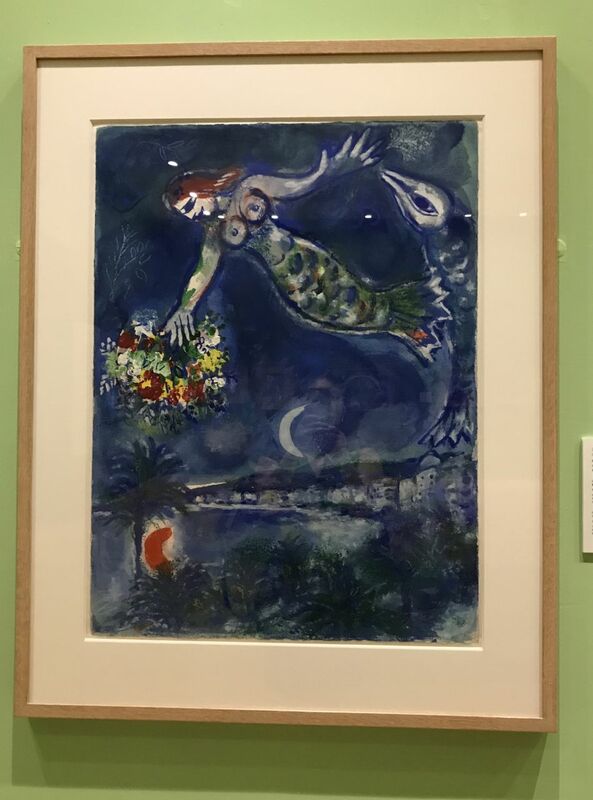 It also revealed how multi-faceted an artist Chagall was -- not only did he paint on canvas, but was also made lithographs, designed ballet costumes and sets, as well as painted murals, ceilings and created stained glass pieces in cathedrals. Oh and collaborated with weavers to make tapestries too. He was born a Hassidic Jew in Vitebsk in 1887 and the theme of the Bible would resonate throughout his work. He described the Bible "like an echo of nature and this secret I have tried to transmit". One of his impressive projects were the stained glass windows for Hadassah University Medical Centre in Jerusalem, where the 12 panels are about the 12 tribes of Israel, the descendants of the 12 sons of Jacob. His life had its ups and downs. His first wife Bella Rosenfeld died in 1944, but then two years later he would have a son with an English woman, Virginia Haggard McNeil, who would later leave him. Chagall would marry again, a woman 25 years younger, Valentina Brodsky, who would manage his affairs so that he could focus on his art. In the 1950s he moved to the south of France and was taken by the warm light, and the deep blue Mediterranean sea. Intense colours took centre stage and many of his works feature deep blues along with other symbols like sirens, fish, and mythical beings. The paintings look so soaked through with colour that they seem so optimistic, playful, romantic and lush. In 1952 and 1954 he went to Greece as he was commissioned by publisher Teriade to do illustrations of the pastoral romance of Daphinus and Chloe. He seemed immensely inspired by this couple and created numerous sketches of them. He also worked on Stravinsky's The Firebird in 1945-46 and the exhibition displays several of the costumes on mannequins. The clothing is described as very light and during fittings, he would personally paint them. Over the years the costumes were worn and mended, but now they are museum pieces. Next to the display was a video showing the performers dancing in the costumes. Chagall was ahead of his time. 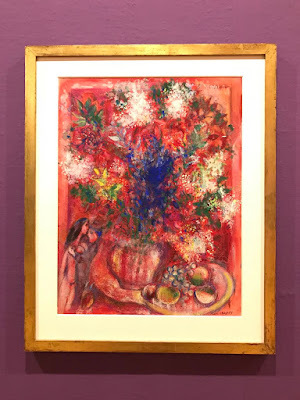 Despite being from Russia, Chagall applied for and was approved for citizenship in France. Many of his commissions were there, including painting the ceiling of the Opera de Paris. He was 77 years old at the time, but personally painted the 220 square metre area. The design pays tribute to 14 composers and their works. 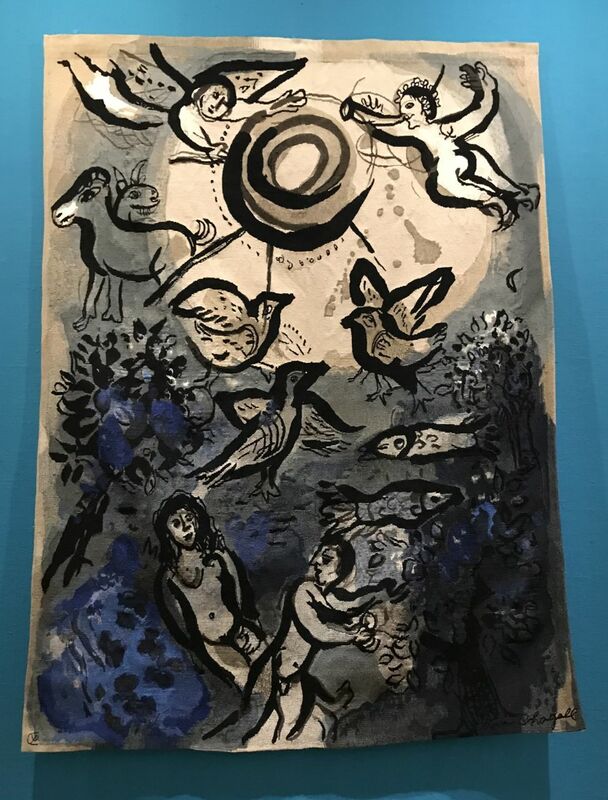 He also made "Biblical Message" in 1955, featuring 12 large oil paintings that illustrate Genesis and Exodus that he donated to the French state in 1966 and wanted them exhibited together. 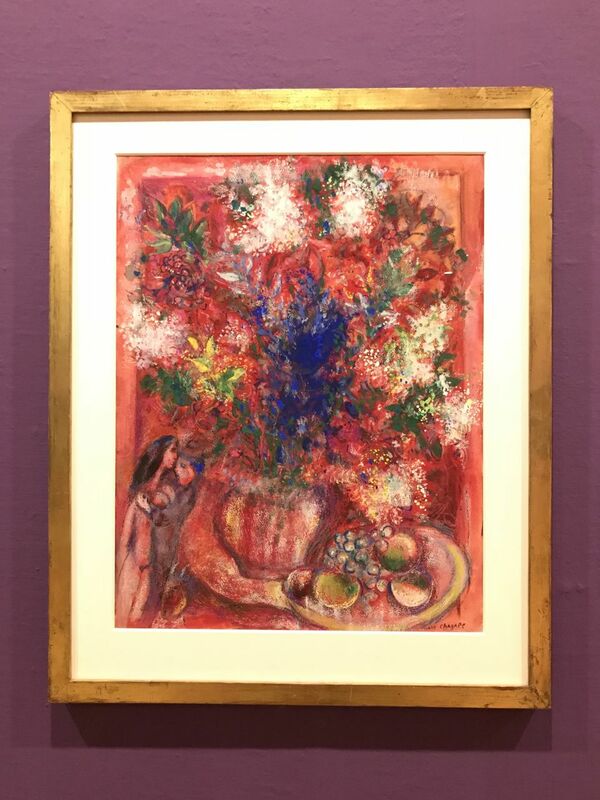 Chagall spent time working on the sketches and small-scale oil paintings that can also be seen in the show. In 1985 he died at the age of 98 and was buried in Saint-Paul de Vence. I learned a lot more about Chagall and his life thanks to this show, that was only visited by a handful of other people in the late afternoon. Even better is that I finally figured out that it is located behind Sands casino; just take the shuttle to Sands and it's a five-minute walk to the museum. HI bluebalu! Hope you can make it to Macau! It's also nice they publish a catalogue to go with the exhibition at a very reasonable price (less than 300MOP).